Home » Enjoying Nature » Little Acorn… Mighty Oak? I uncovered this sprouted acorn in the pile of leaf mold yesterday. We are used to finding stashes of seeds and nuts that the chipmunks and gray squirrels have “planted,” but this little acorn sprouted in the mulch and had already produced a perfect miniature oak tree. And yes… of course I planted it! 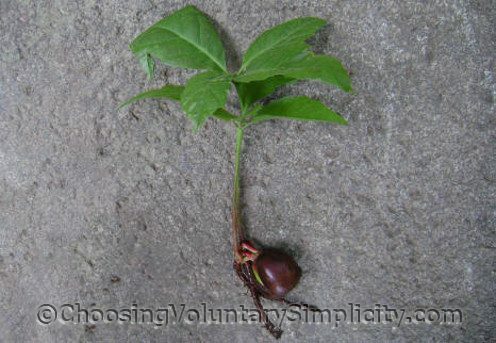 Thanks to your site( the ONLY one) to answer my question as to How to plant an Oak tree nut that has sprouted from laying on the ground. I have now planted it in a poy(5 or 6 to be exact) I hope they grow well as I want them for the wild life. (my favorite in life). Thanks again and wish me luck. 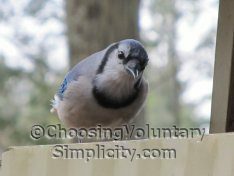 I too was looking for how to plant an acorn and came across your site thru a search. Now looking at the list of your other articles I feel like I’ve hit a jackpot!!!!! !